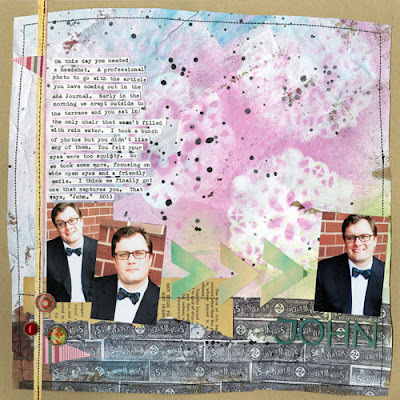 jbs inspiration: July JBS Mercantile! The July Gallery is loaded and it's AMAZING! Stuffed with inspiration! You'll especially want to check out the fun things that have been done with the new exclusive Butterfly Mask and Soda Water Clear Stamp that are only available in July's Main Kit. 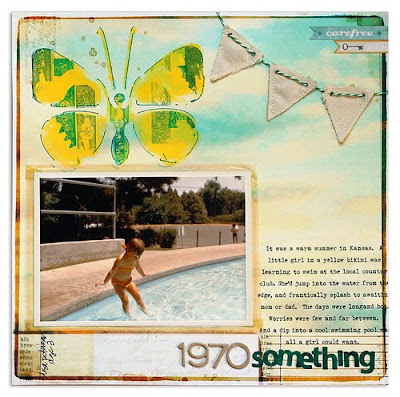 Here are just a couple gallery teasers from Lisa Dickinson (beautiful butterfly above) and this month's guest, Julie Fei-Fan Balzer (stamped soda water label paper below). The gallery is smokin' hot this month! You gals did it again with so much creativity and happy LOs. Love all. Thx and Happy 4th to the best DT ever!